Each year, the Senate Special Committee on Aging keeps records of scams that are reported to their fraud hotline. In 2017, these five scams were reported most often. 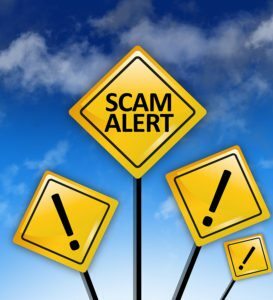 With the Grandparent Scam, a senior receives a phone call from someone pretending to be their grandchild, an officer, a doctor, or a lawyer. They’re told that their grandchild is in trouble and needs money wired immediately. The scam ranges from a grandchild calling to say they’ve been arrested for DUI to a crash where the grandchild needs medical treatment. The call always requires money. In cases where a senior says the caller does not sound like a grandchild, an excuse is made to explain the difference. The “Can You Hear Me?” scam is a tricky one. The senior answers the phone and is automatically asked if they can hear the caller. As soon as the senior answers “yes,” the answer is recorded and used to subscribe the senior up for multiple subscription services or credit card transactions. One man ended up with more than $100 in fraudulent charges after getting the call. As soon as he said “yes,” the caller started talking about a hotel the man had stayed at in the past. The man had not stayed at the hotel and hung up. A week later, he found the charge for a stay at that hotel. Lottery and sweepstakes scams involve a postcard, email, or phone call saying you’ve won money, a vacation, or some other desirable item. To claim your prize, you’re instructed to call a number to give banking information or wire money to the distribution center that is collecting the tax payment on the prize. There is no prize. Robocalls involve a computer that dials a number. When the caller answers, they’re redirected to a live person who then follows through with the scam. A common robocall scam involves offers to lower interest rates. To qualify, your parent has to give a Social Security number and credit card numbers. With the IRS scam, you get an urgent call from a supposed IRS agent who says you’re about to go to jail or be penalized some way for tax fraud. If you wire the unpaid taxes and/or penalty money immediately, you can avoid charges. Keep your parent from falling for a scam. Make sure they know of the latest scams and what information should never be given out over the phone. They may be lonely and more likely to answer the phone. Elderly care services include companionship. With a caregiver available for socialization, your parent is less likely to talk to a stranger. If you or an aging loved-one are considering elderly care in Grand Prairie, TX, please contact the caring staff at Custom Caregivers today. Call us at (972) 702-7988.